Memorial Park Cemetery Association, Inc. The idea for a non-traditional cemetery called a memorial park was brought from Milwaukee, Wisconsin in 1930. White Chapel Memorial Park's first burial was 1934. White Chapel contains 108 acres on all four corners of Niagara Falls Boulevard and Tonawanda Creek Road at 3210 Niagara Falls Blvd in West Amherst. The largest corner on the northwest side is developed for in-ground interment of both traditional casket and cremated remains. The grounds are a park-like setting with-out upright gravestones or on ground flowerpots. All personal memorization is flush with the ground. There are plans for the addition of above ground columbaria that will blend and compliment the parks presentation. White Chapel is non-sectarian. We do however offer several areas for those whose religious beliefs dictate special consideration. 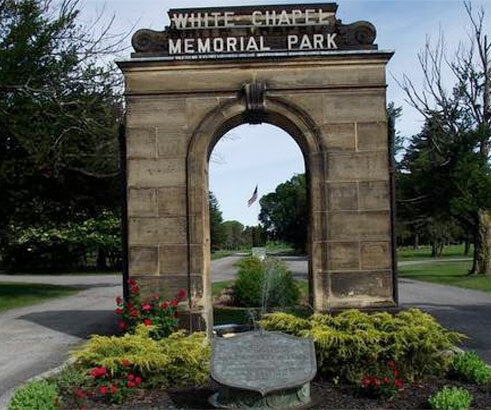 White Chapel offers the most affordable private burial estates in Western New York. Time payment plans are available for both grave purchases and final expenses of burial and memorials at current pricing for that year.